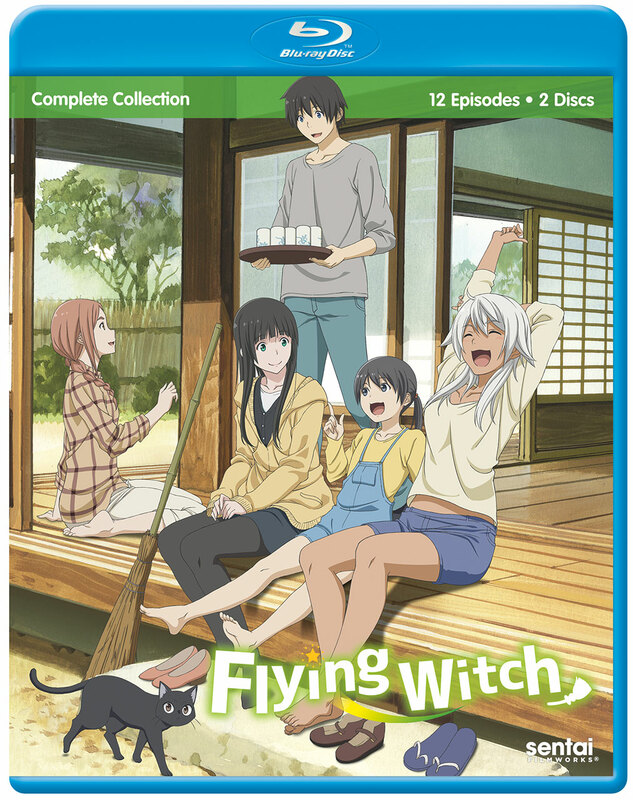 Flying Witch contains episodes 1-12. Traditionally, when a witch turns 15, she's supposed to go out into the world alone to study magic. Makoto's parents, however, believe that their directionally-challenged daughter should get a high school degree. Instead of being sent out on her own, Makoto and her cat Chito find themselves traveling from the bustling city of Yokohama to Aomori Prefecture, where they'll stay with relatives until Makoto finishes school. It's going to be a big adjustment, and it only gets more complicated since "normal" people aren't supposed to know that witches exist… something that she tends to forget. In the meantime, Makoto, her cousins, and her new friends will have to work just a little harder to adapt to a whole new way of life when the new girl in town is a FLYING WITCH! A wonderful example of the magic realism genre where magic is mixed into everyday life. There will be perfectly ordinary things like planting a garden and tending an apple orchard. And then there will be things like going to secret café with a ghost waitress. Kowata Makoto is a 15-year-old witch-in-training she must move from her home in Yokohama to the sticks way up north in Aomori Prefecture to be on her own as she matures into a full-fledged witch. She’s fortunate in having relations up there in the Kuramotos including laid-back wry and laconic Kei and bubbly impressionable Chinatsu. Makoto’s life operates on the proposition that everyday life is magical and magic is mundane but wondrous. A sweet joy ride of a show. Sentai sweetens this release with the Flying Witch Petite anime shorts, an improvement on the usual clean OP/ED. The series was very enjoyable and for me was a good change of pace. I highly recommend for anyone with an interest in this genre.